To create the perfect pair of headphones for listening to music, we approached the design with three things in mind – uncompromising audio, long lasting comfort, and robust portability. 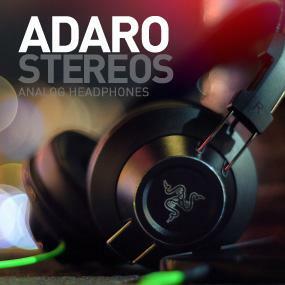 And with the Razer Adaro Stereos, we believe we have done just that. Packing high performance, custom-tuned 40mm neodymium magnet drivers, the Razer Adaro Stereos deliver crisp, natural sounding acoustics for an amazing audio experience. 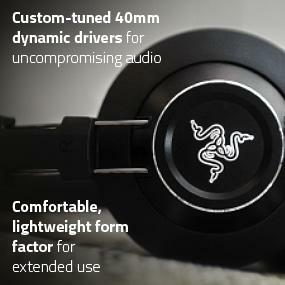 These powerful drivers are housed in the Razer Adaro Stereos’ custom developed, fully adjustable architecture, allowing for an extremely comfortable and lightweight design. The Razer Adaro Stereos are meant for you to take them wherever you go. Their construction is sleek and compact, allowing for easy transportation, yet incredibly robust for endless hours of use. With its brilliant sound, comfortable form factor and portability, the Razer Adaro Stereos are the perfect headphones for music on the go. Personal entertainment has become a mainstay in our daily lives – be it while commuting on the train, winding down after a workout, or even throughout the day in office. With the Razer Adaro series of audio products, we went back to the drawing board, focusing on enhancing the user’s lifestyle. With this in mind, we settled on three things: durability for everyday use, a focus on comfort, and uncompromising audio. Our engineers spent countless hours of research and development to achieve a phenomenal listening experience, and that has resulted in this line of portable audio products. Designed and crafted with meticulous care, the Razer Adaro series was created with you in mind. The heart and soul of the Razer Adaro Stereos lies in the high performance 40mm neodymium magnet drivers that are custom tuned by our audio engineers. Sonically optimized through countless prototypes to complement their inner acoustics chambers, these dynamic drivers deliver amazing audio. Experience music the way it should be heard with the rich, natural sounding acoustics of the Razer Adaro Stereos. Featuring a fully adjustable architecture, the Razer Adaro Stereos are engineered to be lightweight and super comfortable. Through extensive ergonomic studies and experimenting with different materials, we have perfected a circumaural design that ensures you enjoy music without strain. These are headphones so comfortable you forget you’re even wearing them. The Razer Adaro Stereos are crafted to be your aural companion, whether you are chilling on the couch or out on the move. Its overall size is kept to a minimum, allowing for easy transportation, yet incredibly robust for endless hours of use. 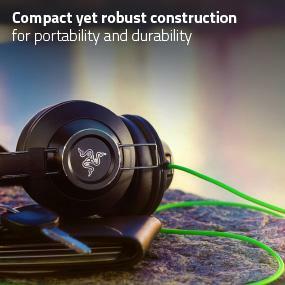 Built for all-day listening, we made no compromise on portability or durability with the Razer Adaro Stereos. Custom-tuned 40mm dynamic drivers. Comfortable, lightweight form factor. Compact yet robust construction. Fully adjustable architecture. Plush leatherette ear cushions. Anti-tangle, braided fiber cable. Compatible with iPhone, Android and mobile devices.